Previous image: The Ark of the Covenant in Aksum (Abyssinia, Ethiopia). This section discusses the meaning of the Ark of the Alliance, but first decodes the year 1486 and two chronological dilations: one is 1000 years old and the other one is 185. According to the search made, the meaning of the Ark of the Alliance (of the Apocalypse) is this: It represents the transformation of Christ-Emperor into the eternal Christ, breaking the power of Christ from the power of the ‘Emperor. The creation of Christ is, therefore, his resurrection. With its transformation an icon is created, with the vocation of being the model for all the people of the world. This project creates Osiris, Jesus, Buddha and Krishna. As the NC shows, they are all the same character. In other words: the Ark of the Covenant represents the end of the symbolic power of the last Great Sovereign (the King of Israel), who “dies” and “resurrects” as an eternal Christ. 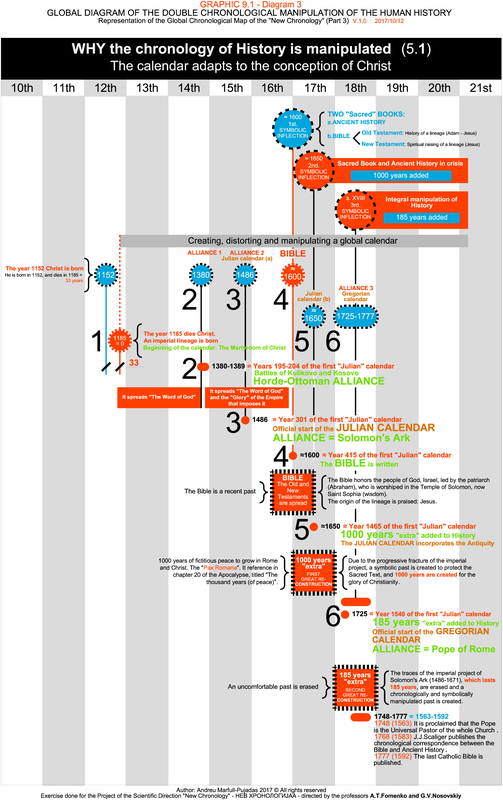 Chapter 11 begins with two witnesses that are before the “Lord of the Earth”, and ends with “the Ark of the Alliance.” It is the Horde-Ottoman “pact” that identifies the NC. Chapter 12 tells the “fight” between a “Dragon” and “angels” to attack/defend a child. The child symbolizes Christ, who goes up to Heaven, that is, he resurrects. Chapter 13 tells the continuation of the struggle between “two beasts”, which are equivalent to the Horde and Ottoman powers. Before, the Apocalypse narrates the struggle of four horse riders for control of the world, symbolizing the Mongol expansion to the four poles (N-S-E-W). After that, the Apocalypse narrates the struggle between earthly powers, which are defeated by the angel of Jesus. That is, it symbolizes the victory of Christ resuscitated. The prophecy of Chapter 11 is located in 1260 days and 42 months. 42 pagan months = 42×30 = 1260 days of preaching. Year 1260 (Jerusalem falls and falls Constantinople). 1260 years occupying the city where the Lord was crucified. The dragon attacks and kills the Witnesses in the holy city. But 3,5 days later they are resurrected. 3+12 hours = 312. Year 312 = Constantine reunites the Empire inspired by St. George, and recognizes Christianity. The seventh trumpet heralds the beginning of the kingdom of God, the Ark of the Covenant. The events prior to the ARK OF THE COVENANT are the years 1260 and 312 (or 33, the resurrection) = The defense of Jerusalem, (Constantinople). In the Official History, the year 1260 coincides with the alliance between the Januese (Genoese) and the emperors fo Nicaea, the Palaiologos. Shortly after, the symbol of the Empire es a double Januese-Roman flag. A woman clothed with the sun, with a moon under her feet, and on her head a crown of twelve stars, gives birth to a child. The child is to rule all nations with a rod of iron. The child is taken up to the throne of God. The dragon attacks the woman, because she wants to devour her child, but God protects her for 1260 days (years). A great struggle takes place in Heaven, and overcomes the blood of the Lamb. It is the second birth of Jesus, which stands at the time of Constantine and St. George. The woman gives birth to Saint George (= Constantine), who beats the Beast by the grace of God. This is the battle of the Milvian Bridge, where Constantine converts to Christianity (year 312). The Edict of Milan, at 41 years of giving birth (to Constantine), promulgates religious freedom and officializes Christian worship. This is the ARK OF THE COVENANT, symbolic, which describes the Apocalypse. They are two stories that overlap: 1260 and 312, with a childbirth and a later a victory. From the birth of Constantine to the Alliance 41 years pass. 1260+41=1301=ARK OF THE COVENANT. It retains the Dragon, the ancient Serpent, chained for a thousand years. It is “the first resurrection”. God gives a thousand years to the martyrs of the testimony of Jesus, who “lived and reigned with Christ a thousand years”. They are 1000 years of peace, which are added to History, giving a new life to “The Word of God”. It is the myth of the “Pax Romana”. It creates a past of 1000 years to glorify Jesus, and promote his eternity in the eyes of the people. It is “resurrected” by making it a myth. The reason for this purpose was the publication, in 1725, of the book Abrégé de Chronologie de M. Le Chevalier Newton, fait par lui-meˆme, et traduit sur le manuscript angelois. (With observation by M. Freret). In this book he shows a different chronology, and it was published by abbot Antonio Conti, the nephew of Pope Innocent XIII. Newton had sent him away, but the abbot published it without his authorization. A remarkable controversy was created, and for this reason Newton wrote this letter. However, he died in 1727 and all the information was lost. Or maybe not? 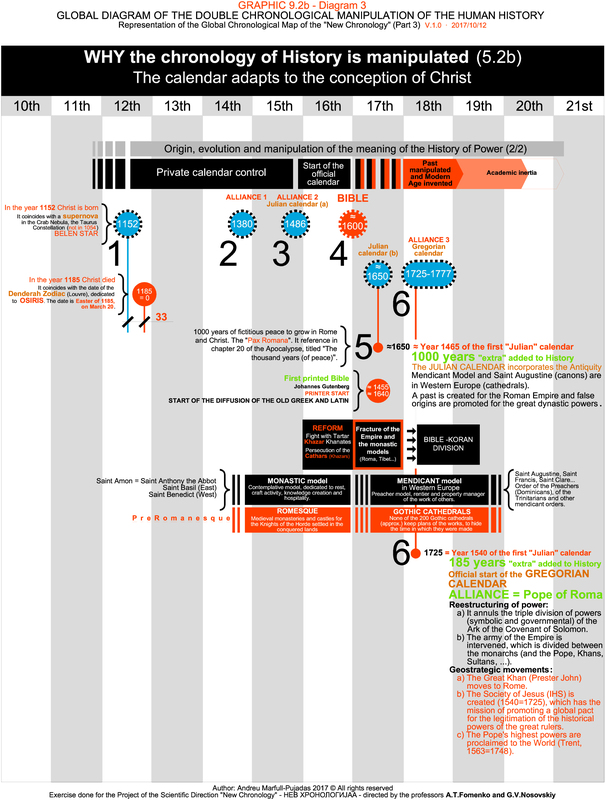 In 1728 the book The Chronology of Ancient Kingdoms Amended. To which is Prefix’d, A Short Chronicle from the First Memory of Things in Europe, to the Conquest of Persia by Alexander the Great was published. Here was a chronological contraction. But another book was published in 1733. It is the book that is analyzed here: Observations upon the prophecies of Daniel, and the Apocalypse of St. John. The apocalypses of Daniel and John describe the Human History. The Sacred Texts are the Human History. It says that the apparition of the beast in the holy city represents the year 312, when Constantine reunites the Empire. Therefore, it locates the facts of 1260 in the year 312. Then he situates the events of the sixth trumpet (preceding the Two Testimonies of the Apocalypse) in 1453. Therefore, it locates the facts of 1260 in the year 1453. 1453 + 312 (resurrection of Christ) = 1453 + 33 = 1486 = ARK OF THE COVENANT. The sixth trumpet sounded to the wars, which Daniel’s King of the North made against the King above-mentioned who did according to his will. In these wars de King of the North, according to Daniel, conquered the Empire of the Greeks, and also Judea, Egypt, Lybia, and Ethiopia: and by these conquests the Empire of the Turks was set up, as may be known by the extend thereof. These wars commenced A. C. 1258, when the four kingdoms of the Turks seated upon Euphrates, that of Armenia major seated at Miyapharekin, Megarkin of Martyropolis, that of Mesopotamia seated at Mosul, that of all Syria seated at Aleppo, and that Cappadocia seated at Iconium, were invaded by the Tartars under Hulacu, and driven into the western parts of Asia minor, where they made war upon the Greeks, and began to erect the present Empire of the Turks. Upon the sounding of the sixth trumpet (Apoc. ix, 1¡3, &c.) John heard a voice from the four horns of the golden Altar which is before God, saying to the sixth Angel which had the trumpet, Loose de four Angels which are bound at the great river Euphrates. And the four Angels were loosed, which were prepared for an hour and a day, and a month and a year, for to slay the third part of men. By the four horns of the golden Altar, is signified the situation of the head cities of the said four kingdoms. Miyapharekin, Mosul, Aleppo, and Iconium, which were in a quandrangle. They slew the third part of men, when they conquered the Greek Empire, and took Constantinople, A. C. 1453, and they began to be prepared for this purpose, when Olub-Arslan began to conquer the nations upon Euphrates, A. C. 1063. The interval is called an hour and a day, and a month and a year, or 391 prophetic days, which are years. In the first thirty years, Olub-Arslan and Melechschah conquered the nations upon Euphrates, and reigned over the whole. Melechschah died A. C. 1092, and was succeeded by a little child; and then this kingdom broke into the four kingdoms above-mentioned. These words are the last contribution of Isaac Newton, and are the key to decode the chronology of the Ark of the Covenant. The four kingdoms are the four riders of the Apocalypse, who occupy the world. The young child represents the origin, is Andronicus Comnè (located in 1053 and 1152, according to the NC). It represents his resurrection. 39 prophetic years (391 and 1092-1053=39). The 1053 represents a duplicate of the birth of Christ, as demonstrated by the NC. 1453 + 39 = 1492 = NEW ERA. I.Newton shows us that 185 years are created, between the years 1301 and 1486. If the Ark of the Covenant was in 1301 in the Julian calendar, it means that it is the year 1486 in the Gregorian calendar. The year 1492 is the year 7000 of the Constantinopolitan calendar (Byzantine). The year 1492 = year 7000 since the creation of the World = NEW ERA. 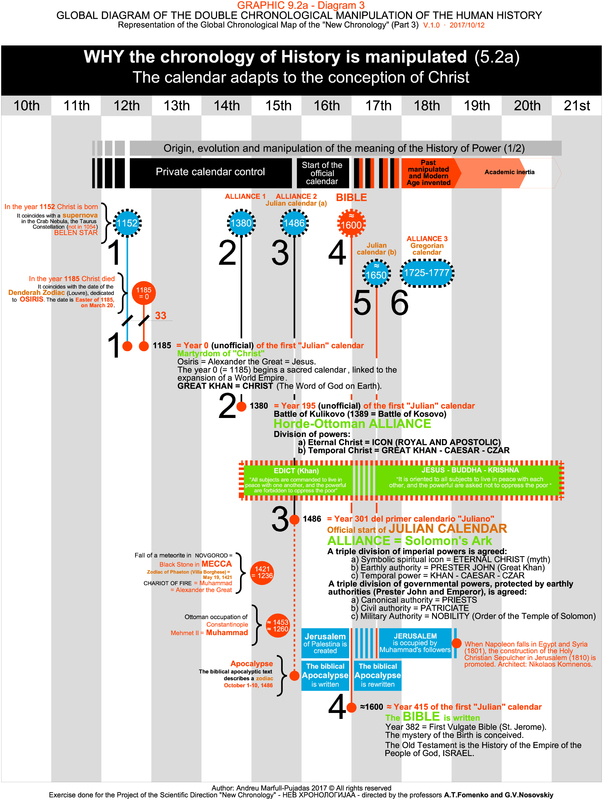 1453 (end of the Empire) + 33 (life of Christ) + 6 (6 hours of martyrdom, death) = 1492 (Resurrection). The French philosopher Ernest Renan (823-892) identifies a zodiac described in the Apocalypse. Book The Greek Anthology (1907, published in 1899 by The Scott Library), page 353. The biblical apocalypse hides a date, transcribed in the zodiac it describes. Anatoly T. Fomeko and Gleb V.Nosovskiy determine that the zodiac’s dating of the Apocalypse is 1-10 October 1486. ​​Book History: fiction on science? Chronology 1 (2003, Delamere Publishing). Date of the Apocalypse = 1-10 October 1486 = ARK OF THE COVENANT <==> 1486 – 185 = 1-10 October 1301. On October 10, 1486, according to the official chronicles, King John II of Portugal sent two embassies to Prester John to plan a World Alliance to put pressure the Turks: by land and sea. It represents the beginning of the European colonization of the World, and coincides with the journey in which Portugal crosses for the first time Africa to the south, giving name to the Cape of Good Hope. The year 1486, in real time with respect to the Julian calendar (= 1301), establishes the ARK OF THE COVENANT that custody the Prester John. The year 1486 renews the Ark of the Covenant of 1301. Thus it has been written. The Revelation of John does not refer to St. John, but to Prester John. What does this chronicle show? Russia-Horde of the XIV-XVI cc. and the Czar-Grad kingdom of the XI – the early XIII cc. are crucial for practically all ‘ancient’ Scaligerian history. Here is a list of the main phantom reflections of the Russian czars-khans of the 1276-1600. The ‘ancient’ Russian history (≈10th-13th cc. AD.). The Habsburg Empire (1273-1600 AD.). The Holy Roman Empire (≈10th-13th cc. AD.) . The ‘ancient’ Kingdom of Israel, according to the Bible. The ‘ancient’ Kingdom of Judah, according to the Bible. The Third Roman empire (≈3rd-6th cc. AD.). The Second Roman Empire (≈1st c. BC–3rd c. AD.). The Czar Rome = The First Roman empire (≈8th-6th cc. BC.). The first half of the Byzantine Empire (≈830-980 AD.). The first half of the Third Byzantine Empire (≈1150-1300 AD.). The history of Mediaeval England (≈400-1327 AD.). The Empire of the Carolingian Empire (≈680-890 AD.). PARTIAL CONCLUSION: The Bible, Ancient History and the 15th and 17th c. began to be written in the 17th century, and all the texts are the same story: the expansion of the Mongol/Horde Empire, which occupies almost the whole world. What does this chronicle show?, written in the 18th and 19th centuries? The Mongol Empire and the Russian Horde are the same project, which has its climax around the 14th and 15th centuries with the expansion of Christianity from Paris to Beijing, by the Franciscans. After (between the 16th and 18th centuries) their destinies are separated. At the moment of maximum expansion an decree proclaims: “All subjects are commanded to live in peace with one another, and the powerful are forbidden to oppress the poor”. Until then, the Great Khan is the only sovereign, and his word is the will of Heaven on Earth. 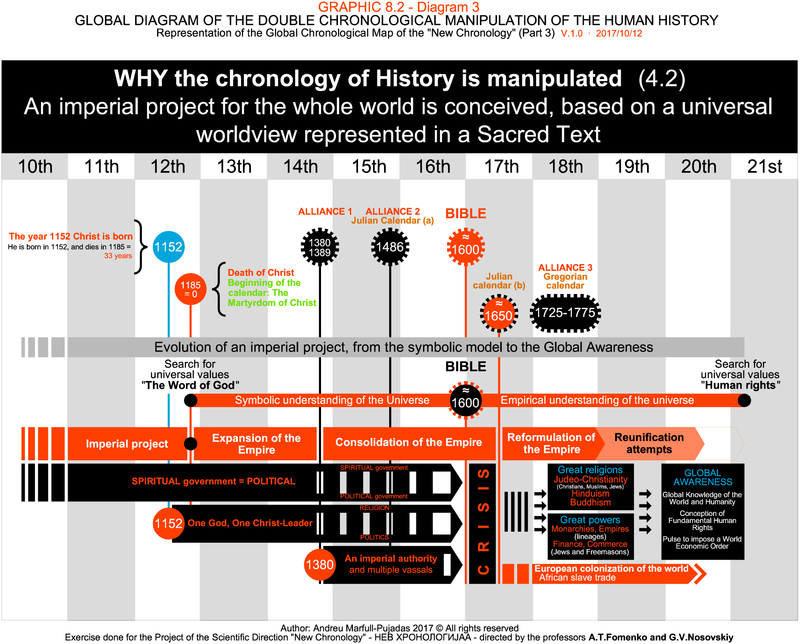 The chronology of this expansion corresponds to the chronological reconstruction promoted by the New Chronology. King David of Israel is equated to the Great Khan, and this one to Prester John of the Indies (who moves to Ethiopia). The Mongols were descendants of the Magi from the East. PARTIAL CONCLUSION: The Mongolian project is the same of the people of Israel, and Canaan is the whole world. Genghis Khan would be King David. They are the people of God, that Christianity becomes theirs, and they are at the root of the main spiritual schools of the world. That is why the Mongols and the Israelites are a people of shepherds. Prester John becomes, around the 15th and 17th centuries, the Great Khan that moves to Ethiopia, at a time when the edict proclaiming the rule of peace and justice for all is decreed. It is the message of the New Testament and that of the main sacred books. The Prester John appears, then, from the hand of the myth of Jesus / Krishna / Buddha, and is their common origin. The Magi of the East would be Khans who would have “blessed” the appearance of the “Christ” that they spread themselves. What does this manuscript show?, written before the 19th century and dated to the end of the 15th century? The manuscript explains the origin of the powers of Christianity, linked to Prester John, and the origin of the powers of the lineages of the Kingdom of Castile. It is located in the Biblioteca Nacional de España. The greatest power falls on Prester John, of Abyssinia, who has as vassals two emperors, one from Greciana (Greece) and the other from Damascus. They represent the Ottoman sultan (or of Babylon) and the Greek emperor. Prester John is a descendant of the Great Khan, who by indications of three Indian kings (three Khans) becomes the Lord of the Indies and earthly ruler. In the same election, the three kings and all the great men of the Indians agree to choose the memory of the Apostle Thomas as spiritual leader for the perpetual government of their lands. This leader would be Holy and die a virgin, and Prester John would not call himself King or Emperor. The glorious kings were called Melchor (King of Nubia, who offered gold), Baltasar (King of Galijsaba, who offered incense) and Gaspar (King of Tarsi and Visol or Grisolia, where the apostle St. Thomas was buried). The Chronicle of Prester John explains that there was a great Indian prince who had only one daughter, who had to marry, and he did it with a Christian gentleman from Western Europe. The union causes a struggle with the followers of the law of Muhammad. Marriage is blessed by water (by John the Baptist), by fire and by blood. The Holy Father is equated with Prester John. It is indicated that the history of the three Kings and the history of marriage that supposes the acceptance of the law of Christ are the same history. The supposed author of the manuscript was Diego Hernández de Mendoza, the chronicler of the Count of Ribagorza and Cortés, of Navarre, to whom he dedicated some heartfelt words. Other interesting chronicles are narrated, which require a separate study. Example: the king of Aragon has the great honor of being a descendant of the Goths that conquered Asia, and comes from the “getas” (from Romania). The “getas” would have confronted their masters and then returned to their homeland to recover their women (occupying Greece). PARTIAL CONCLUSION: This manuscript shows the design of Prester John and Christ, who is not originally called Jesus and is a model inspired by St. Thomas. Christ and the Prester appear by the work of three kings, who would be three Khans of the Indies, who would have decided to honor their spiritual leader Thomas. They are, literally, the Magi, which the New Testament would have transformed into the chronicle of three kings who would have come from the East to praise the new King of Israel. This episode is framed with the marriage of the princess with a Christian knight, and corresponds to the myth of Mary Magdalene. Marriage is also a pact, the Horde-Ottoman alliance that identifies the New Chronology by Fomenko and Nosovskiy, and represents the authority of Christ of the descendants of the princess. This pact would be equivalent to the Ark of the Covenant (of Solomon), which would guard in Ethiopia the Prester John (and the Emperor of Ethiopia). In a parallel reading, it amounts to the myth of Mary Magdalene, who would have married a king of Western Europe, and would have given birth to Christian powers in Europe, causing the legends of Paris and Helen, of Helen of Troy, of the beautiful Vianna and the gentleman Pierre of Provence, of Eudoxia Komnene and William of Montpellier and, likewise, the chronicle of the powers of the fleur de lys merovíngia (Anjou) and of the same Cleopatra and Marcus Aurelius. NOTE: Regarding the reference to the Count of Ribagorza and Cortés, of Navarre, indicate that it would be (as described below) the powers of the Nicaea Empire transferred to Catalan lands. The Laskaris would become Counts of Ribagorza and Cortes, and would be Borja powers, being the powers of Hernán Cortés and (probably) of Christopher Columbus. They would have transferred the imperial project to Hispania, Provence and Italy (in Hesperia), and would have taken the power of Prester John to Rome, designing the project of the Pope of Rome, as world leader. The Laskaris would also have been the root of the Holy Roman Empire of the German Nation, which the New Chronology places in the 17th and 18th centuries (previously it is a copy of the Mongol / Horde Roman Empire). The Pope of Rome, like new Great Khan, appears to reconstruct the Roman Empire from Europe, but (as shown in this exercise) the result is other. As a result, history is rewritten in its entirety, in the 18th century. What does this story show? The story represents the final judgment, in the hereafter, to express the strength of the judgment of the divine throne, along with the story of a god born among men to save the world from the evil power coming from Ethiopia. The story represents a struggle between Egypt and Ethiopia, between two wizards called Horus. The Ethiopian Horus is presented as a page from Ethiopia, which carries a sealed letter that challenges at the Pharaoh to discover what it says. Si-Osiris, son of Setme and grandson of Pharaoh, reveals the content: it is the prophecy of a curse that will fall on Egypt, announced by three Ethiopian magicians. To defeat the Ethiopian Horus, an Egyptian Horus appears, and they fight. In the end the Egyptian Horus wins, which implores Osiris, the great God. Along the way, are tortured the Pharaoh and the Viceroy of Ethiopia with 500 lashes each. Horus of Egypt, when he wins, reveals that he is really Si-Osiris. Once Si-Osiris (son of Osiris also named Horus of Egypt or Horus son of Panesit) beats Ethiopian Horus (son of The Black or also named Horus son of Tnahsit, or son of the Princess), he gets that the Horus Ethiopian and his mother are committed not to tread Egypt for 1500 years. After 1500 years, Si-Osiris definitively defeats the Ethiopian Horus. The Egyptian Horus is the son of Osiris, and is born among men by God’s will (Osiris), which is announced in dreams to Mahistusket, the wife of Setme, the son of Pharaoh. Setme dreams that he will be called Si-Osiris and will do wonders in the land of Egypt. The conception of Si-Osiris is narrated at the beginning of the story. In the end, Si-Osiris explains his mission: save the world, and disappears willing to return. Next, Setme and Mahistusket have another son, named Wsj-Mnt-H.r (“mighty dove of Horus”). PARTIAL CONCLUSION: As Llogari Pujol Boix deciphers, it is a story with significant parallelisms with the New Testament, both in the figure of Christ and in the story of the Apocalypse. However, in this exercise it is interesting to highlight the fact that God (Osiris) is transformed into Si-Osiris and then into Egyptian Horus, to end up creating the “mighty dove of Horus”, which represents his eternal glory. Si-Osiris would be John the Evangelist, Egyptian Horus would be Jesus and the dove would be the coming of the Holy Spirit. Si-Osiris and Horus are both John the Evangelist and Jesus, since they are the same work of God. The 1500 years of peace indicate that the facts are around the year 1500, pointing to 1486 (the Ark of the Covenant), and this parallelism indicates that this story is written in the s17th or 18th century, not before, as it incorporates the added 185 additional years to the 1000 years of Pax Romana. The Black, or the Princess of Ethiopia would be, in reality, the myth of Mary Magdalene, and her son will be the last emperor who claims to be Christ (Horus). John the Evangelist (Si-Osiris) is the Prester John, who blesses Jesus (Horus), with the ultimate goal of redeeming humanity with the coming of the Holy Spirit. Making a complementary reading, it represents that Christ comes eternal, and ceases to be a symbol associated with the “sovereign of the world”, the Great Khan, who receives the “sacrifice” on the part of the priests. The lashes to the King of Israel (Jesus), the Pharaoh and the Viceroy of Egypt are the symbol of his sacrifice. Since then, the soul of Christ is transferred to men, and the emperors become mortals. Finally, the challenge of Ethiopia in Egypt represents the imposition of Prester John, who from then on guards the secret of the imposition of the law of Horus, of Jesus, designed in the Ark of the Covenant ofthe Apocalypse. What does this prophecy contain? Contains the history of humanity from Christ until the 15th century, as described by Isaac Newton. Expresses the manipulation of the historical text twinned with the biblical text, as A.T.Fomenko and G.V.Nosovskiy decipher. Count the struggle for control of the Holy Land (Constantinople, Egypt and Palestine) between 1260-1301 (=1445-1486) as is revealed by Isaac Newton. It represents the struggle of the myth of Osiris that leads to the pact or alliance between the Horde and the Ottomans, which is custodied by the Prester John in Ethiopia. It contains a horoscope dated October 1/10, 1486, 33 years after the fall of Constantinople. It represents the resurrection of Christ, six years before 1492, in the biblical 7000 year of the Byzantine calendar. The six years are the six hours that Jesus needs to die on the Cross. It contains the transformation of Christ into an icon, in chapter 12, to strip the kings of the beast of the power of the authority of Christ in their hands. This “resurrection” is equivalent to the Ark of the Covenant that is described at the end of chapter 11. The fight of the beasts of the Apocalypse, the fall of prostituted Babylon and the return of the angel of Jesus represent the earthly struggle and the heavenly victory of truth, which is revealed in this book. It contains the myth of Mary Magdalene, the woman persecuted by the beast in chapter 12 for having given birth to a child who will end ruling the world from Heaven. It represents the creation of the eternal Christ, protected by the gods, while representing his victory over the kings of the world, who are all children of the same woman. The four horsemen of the Apocalypse are the Mongol armies that conquer the world to its four corners, before the creation of Christ and the announcement of the empire (prophecy) of a better world. JOINT CONCLUSION: The prophecy of the Ark of the Covenant of the Apocalypse contains two main keys. The first is that until the year 1301 (1486) there is no eternal Christ, Jesus, who appears as a result of a struggle that ends with a pact between two great emperors. The covenant is sealed in the Ark of the Covenant (of Solomon, of the “peace of Amon”, of “God”) that passes to guard the Prester John. The Prester John is the same John who writes the Apocalypse. And the second is that Ancient History until the 15th century is a parable that dialogues with the Bible. This would have been the meaning that Isaac Newton gives to his posthumous work “Observations upon the Prophecies of Daniel, and the Apocalypse of St. John” (of 1733). 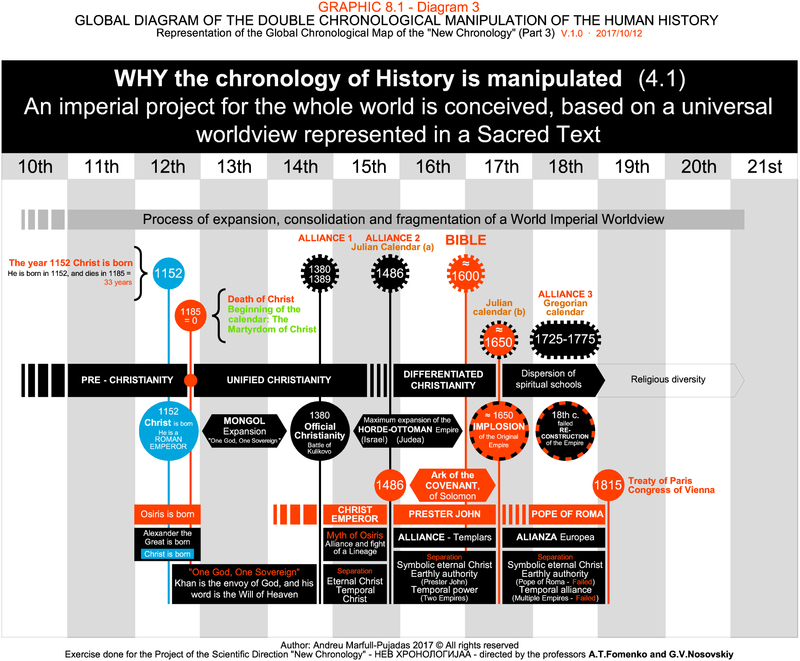 The reason for the manipulation of History? … the historical recreation aims to create a divine origin for Christ and an earthly origin for the powers of the governors of the world, to protect humanity from the authority of a Sovereign Earthly God, as would have been the Great Khan and the struggle incessant among his heirs. Sumarizing, it is a recreation to protect the power of God, the great creator, and to the humanity of his power in bad hands. That is, to protect the strength of Peace and Wisdom, the Light, which the Egyptian priests would have designed to establish a symbolic empire, with the vocation to impose a definitive world order after having occupied it. King Solomon judges two mothers, who demand the same child. Solomon proposes to split it in two, but one of them refuses. She does not want her to die. Solomon understands that she is the true mother, and he gives the child to her. MEANING: The son is Horus (Christ), who is the subject of a dispute between two empires (the Horde and the Ottoman). If the child is divided, he will die. If he is delivered to the true mother, he will live (he will resurrect). The true mother represents the original church. Following the narrative of Setme II, in the end the Egyptian Horus wins, the original. 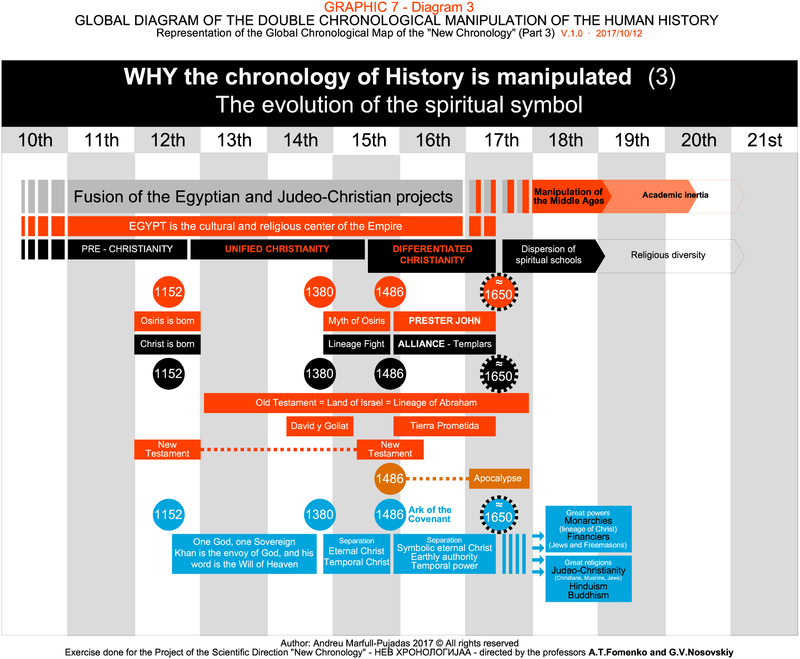 This graph shows the parallelism between the evolution of the symbol of Christ and the fracture of the symbolic power. It shows the tendency to the spiritual fracture, of a project that was born unified. Parallelism between the evolution of the Empire and the evolution of the symbol of Christ. Parallelism between the evolution of the Empire and the evolution of political and spiritual powers. At the beginning, the “Word of God” is designed, with the highest universal value. In the 21st century, “Human Rights” is taking shape. There are two ways of promoting universal justice. 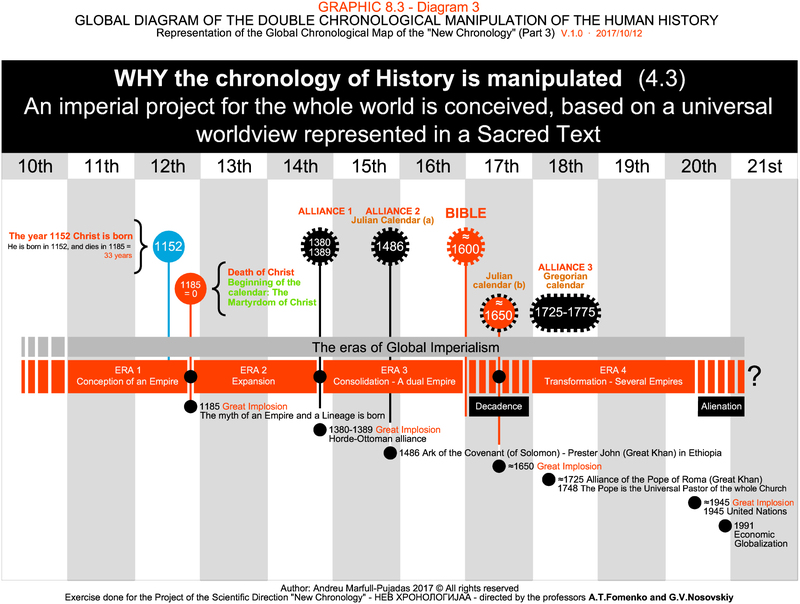 Parallelism between the evolution of the “sacred text” and the design of the chronological map. The year 1152 Christ is born. He is born in 1152, and dies in 1185 = 33 years. It spreads “The Word of God”. It spreads “The Word of God” and the “Glory” of the Empire that imposes it. BIBLE. The Old and New Testaments are spread. The Bible is a recent past. The Bible honors the people of God, Israel, led by the patriarch (Abraham), who is worshiped in the Temple of Solomon, now Saint Sophia (wisdom). The origin of the lineage is praised: Jesus. 1000 years “extra”. FIRST GREAT RE-CONSTRUCTION. 1000 years of fictitious peace to grow in Rome and Christ. The “Pax Romana”. It reference in chapter 20 of the Apocalypse, titled “The thousand years (of peace)”. Due to the progressive fracture of the imperial project, a symbolic past is created to protect the Sacred Text, and 1000 years are created for the glory of Christianity. 185 years “extra”. SECOND GREAT RE-CONSTRUCTION. An uncomfortable past is erased. The traces of the imperial project of Solomon’s Ark (1486-1671), which lasts 185 years, are erased and a chronologically and symbolically manipulated past is created. 1748 (1563) It is proclaimed that the Pope is the Universal Pastor of the whole Church. 1768 (1583) J.J.Scaliger publishes the chronological correspondence between the Bible and Ancient History. 1777 (1592) The last Catholic Bible is published. Parallelisms between the fragmentation of the symbolic power, the design of the chronological map and the institutionalization of the Church. Osiris = Alexander the Great = Jesus. The year 0 (= 1185) begins a sacred calendar, linked to the expansion of a World Empire. GREAT KHAN = CHRIST (The Word of God on Earth). In the year 1152 Christ is born. It coincides with a supernova in the Crab Nebula, the Taurus Constellation (not in 1054). BELEN STAR. In the year 1185 Christ died. It coincides with the date of the Denderah Zodiac (Louvre), dedicated to OSIRIS. The date is Easter of 1185, on March 20.
a) Eternal Christ = ICON (ROYAL AND APOSTOLIC). b) Temporal Christ = GREAT KHAN – CAESAR – CZAR. 1380 – ≈1600. EDICT (Khan): “All subjects are commanded to live in peace with one another, and the powerful are forbidden to oppress the poor“. ≈1650 – 21st c. JESUS – BUDDHA – KRISHNA: “It is oriented to all subjects to live in peace with each other, and the powerful are asked not to oppress the poor“. 1421 (1236) Fall of a meteorite in NOVGOROD = Black Stone in MECCA. Zodiac of Phaeton (Villa Borghese) = May 19, 1421. CHARIOT OF FIRE = Muhammad = Alexander the Great. ≈1453 (≈1260) Ottoman occupation of Constantinople. Mehmet II = Muhammad. 1486 APOCALYPSE. The biblical apocalyptic text describes a zodiac. October 1-10, 1486. 16th c. Jerusalem of Palestine is created. ≈1650/1700 JERUSALEM is occupied by Muhammad’s followers. When Napoleon falls in Egypt and Syria (1801), the construction of the Holy Christian Sepulcher in Jerusalem (1810) is promoted. Architect: Nikolaos Komnenos. Year 382 First Vulgate Bible (St. Jerome). The mystery of the Birth is conceived. The Old Testament is the History of the Empire of the People of God, ISRAEL. ≈1640 (≈1455) First printed Bible. Johannes Gutenberg. PRINTER START. START OF THE DIFFUSION OF THE OLD GREEK AND LATIN. Mendicant Model and Saint Augustine (canons) are in Western Europe (cathedrals). A past is created for the Roman Empire and false origins are promoted for the great dynastic powers. ≈1380 – 16th c. MONASTIC model. Contemplative model, dedicated to rest, craft activity, knowledge creation and hospitality. Saint Amon = Saint Anthony the Abbot / Saint Basil (East) / Saint Benedict (West). ROMESQUE. Medieval monasteries and castles for the Knights of the Horde settled in the conquered lands. 17th-19th c. MENDICANT model in Western Europe. Preacher model, rentier and property manager of the work of others. Saint Augustine, Saint Francis, Saint Clare… Order of the Preachers (Dominicans), of the Trinitarians and other mendicant orders. GOTHIC CATHEDRALS. None of the 200 Gothic cathedrals (approx.) keep plans of the works, to hide the time in which they were made. 16th c. REFORM. Fight with Tartar Khazar Khanates. Persecution of the Cathars (Khazars). 17th c. Fracture of the Empire and the monastic models (Roma, Tibet…). a) It annuls the triple division of powers (symbolic and governmental) of the Ark of the Covenant of Solomon. b) The army of the Empire is intervened, which is divided between the monarchs (and the Pope, Khans, Sultans, …). a) The Great Khan (Prester John) moves to Rome. b) The Society of Jesus (IHS) is created (1540=1725), which has the mission of promoting a global pact for the legitimation of the historical powers of the great rulers. c) The Pope’s highest powers are proclaimed to the World (Trent, 1563=1748). The King of France (Anjou = Byzantine Angelus) intervenes the Order of the Temple of Solomon, and requisition his assets and treasures accumulated in France. 1678 (1493) Columbus occupies the Templar base of the Caribbean (2nd voyage). The Hispano-Portuguese project (Habsburg = Byzantine Laskaris) begins to occupy the World. A European alliance against the Bourbon-Anjou (= Angelus) challenge begins. 1725 (1540) Rome approves the foundation of the SOCIETY OF JESUS. 1725 (1540) TREATY OF VIENNA. The negotiations on the division of powers between all the new European nation-states are over. It is founded “officially” in Paris 1719 (1534), being a project defined in Barcelona. MISSION: To inform the World of the new chronological map and of the new symbolic power impelled in Rome. History Schools are created around the World. In 1773, the Society was abolished in the orbit of the Bourbon: Spain, Portugal, Parma, Two Sicilies … (not suppressed in Russia or Prussia). The Council of Trent ends. Hierarchical organization is reinforced in the Catholic Church. The Sacraments of the Catholic tradition are defined. 1768 (1583) De emendatione temporum, de J.J.Scaliger. First chronological compendium that orders the Bible with the ancient civilizations, and that is used until the 21st century. The last edited edition of the Bible is published. It is presented as a source of divine revelation. This character is granted to Tradition and its free interpretation is denied.